In 1975 the American author Frank Waters published a book entitled Mexico Mystique: The Coming Sixth Age of Consciousness. In this book Waters suggested that "the end of the Mayan Long Count cycle" would coincide with a shift in the global consciousness of humanity. This was an idea that found an echo in the works of such writers as Jose Arguellas (The Transformative Vision) and Terence McKenna (The Invisible Landscape). All of these authors are now deceased. Another American author, by the name of John Major Jenkins, has attracted a vast following as a result of a series of books he has published linking the year 2012 to a unique astronomical alignment. In these books Jenkins has advanced the view that the Maya intended to end their Long Count calendar on December 21, 2012, because this would be the day that the earth would be at a point in space which Jenkins called the "Galactic Alignment". According to Jenkins, this would be the date when the Sun and the planets would be precisely aligned with the galactic equator. He also went on to claim that as a result of their shamanistic insights gained as a result of the ingestion of hallucinogenic plants, the Maya anticipated this conjunction and predicted that it would lead to a profound spiritual awakening of mankind. Critics of Jenkins have argued that the galactic equator is an entirely arbitrary line that can never be precisely drawn because it is impossible to determine the exact boundaries of the Milky Way. In any event, using the calculations for the line of the galactic equator which Jenkins himself had employed, scientists found that the most precise convergence with the center of the Sun had already occurred in 1998. Furthermore, Maya scholars contend that there is little evidence, archaeological or historical, that the Maya placed any importance on the Milky Way, especially since there is no glyph in their writing system to represent it, and no astronomical or chronological table that is linked to it. So the precise reference by Jenkins to the winter solstice in 2012 seems to them to be arbitrarily contrived. The year 2012 has also been linked with numerous other astronomical events, including threats of solar flares and CMEs (Coronal Mass Ejections) from the Sun. This idea has also been burned into public awareness through the release of such movies as the 2009 science fiction film "Knowing" starring Nicolas Cage, as well as the Box-office hit "2012" which included references to Mayanism and the Long Count calendar. Scientists have long known that the Sun has a cycle of sunspots that last about eleven years. During this period solar sunspots vary, as do the number and size of flares and coronal emissions associated with this activity. But because the Sun is believed to be due to reach a maximum (solar max) in its 11 year cycle around the years 2011 or 2012, certain sensationalist writers have suggested that the earth will be exposed to life-threatening solar flares at the time of the winter solstice in 2012. 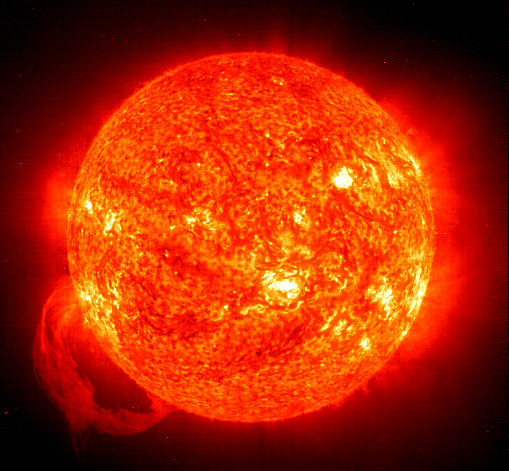 While our Sun is unpredictable and can certainly eject a massive burst of radiation towards the earth at any time, regardless of the sunspot cycle, it is worth remembering that that periods of intense solar radiation have occurred on numerous occasions in the past, without this being a threat to the existence of humanity. The annual threat from solar activity to people on earth is very small, and the worst that can generally happen is a disruption in power or communications. Although the various predictions associated with the year 2012 may make gripping reading, and conjure up sensational scenarios of spiritual enlightenment or impending doom, they are invariably based on flimsy logic and slipshod research. One can safely conclude that none of these sombre pronouncements are likely to be realized in the coming year. Certainly, none of them can be attributed to the Maya or their calendar. That is because the fundamental unit of the Long Count calendar was the Tun. But as explained above, one Tun was equal to 360 days. It does not seem to have crossed the minds of modern Mayan commentators and scholars to ask the question why a culture that has come to be recognized as the most accurate astronomical observers of the night sky, should have picked a cycle of days that bears no relevance to our present scientific knowledge. The basic unit of the "Long Count" calendar of the Maya was the Tun, whichconsisted of a cycle of 360 days. Following on from this were increasing multiples of Tuns such as the K'atun (7,200 days), then the B'aktun (144,000 days), the Piktun, the Kalabtun and so on. However, modern scientists calculate time by the solar year, which is the time it takes for the earth to move around the Sun. Our solar year is approximately 365 and a quarter days. So the question posed was why, if the Maya were such renowned astronomers in the ancient world, did they choose 360 days as the basic unit of the Long Count calendar, instead of the 365 and a quarter days that we use today. Surely it would have been natural for them to use the solar year as their basic unit of time. The answer to this riddle is very simple. They did! According to the Long Count calendar, the fifth world age in which we are now living began on August 11, 3114 BC. The astonishing truth that has escaped Mayan scholars up until now, is that in 3114 BC the solar year actually was 360 days! The earth had a different orbit around the sun. The corollary must be equally apparent and that is, sometime between 3114 BC and the present, the earth has changed its orbit around the sun! Now this is an assertion that might seem ludicrous in the extreme, and one that the astronomers of today would simply reject outright. But what these scientists do not realize is that the recorded works of societies that lived on earth at that time still exist, and they tell a very different story from what we believe today. It is also the reason why the Long Count calendar has lost its predictive value and is no longer used by the Maya today. The confusion between the modern length of the solar year and that recorded by ancient cultures has been neatly summarised by the Russian-born American scholar Immanuel Velikovsky. "All over the world we find that there was at some time the same calendar of 360 days, and at some later date, about the seventh century before the present era, five days were added at the end of the year, as 'days over the year' or 'days of nothing'." As Velikovsky has pointed out, it was not only the ancient Maya who referred to a solar year of 360 days divided into months of 30 days, so too did the Incas of Peru. The ancient Peruvian year was divided into twelve Quilla (or moons), each comprising 30 days. At a later time five extra days were added to their calendar, and were referred to as Allcacanquis. As author W. Hales noted in his book New Analysis of Chronology published in 1809, the calendar of the ancient Chinese also consisted of 360 days divided into twelve months of 30 days. They too later added five days to their solar year, referring to these extra days as Khe-ying. Similar results have been found by researchers into the Hindu Vedas. The German scholar Thibaut, writing in 1899 noted: "All Veda texts speak uniformly and exclusively of a year of 360 days. Passages in which this length of the year is directly stated are found in all of the Brahamanas. It is striking that the Vedas nowhere mention an intercalary period, and while repeatedly stating that the year consists of 360 days, nowhere refer to the five or six days that actually are part of the solar year." In the Bundahis, the sacred book of the Persians, it was recorded that the year was composed of 360 days divided into twelve months of thirty days each. In the seventh century before Christ, five Gatha days were added to their calendar. These Gatha days were supplementary days added to the original 360 days in order to conform to the length of the new solar year. Long before their cuneiform script was deciphered, it was known that the Babylonian year had only 360 days. Writing in 1888, the scholar J. Gilmore recorded that the Greek historian Ctesias of Cnidus, who lived in the 5th century BC, wrote: "The walls of Babylon were 360 furlongs in compass, as many as there had been days in the year." Likewise, the Assyrian year consisted of 360 days, with a decade (called a Saurus) amounting to 3,600 days. The story is the same in ancient Egypt. The Ebers Papyrus states that during the 18th Dynasty the calendar had a year of 360 days divided up into 12 months of 30 days. The Book of Sothis attributed to the Egyptian priest Manetho, indicated that this 360-day year was later changed, and that in the eighth or seventh century BC five additional days were added, that were referred to as the epagomena, or "inauspicious" days. Cleobulus, who was considered to be one of the seven sages of ancient Greece, noted in a famous allegory regarding their calendar: "The father is one, the sons are twelve, and each one of them has thirty daughters." The ancient Romans also counted 360 days to a year. The Greek historian Plutarch, who later became a Roman citizen, wrote in his Life of Numa, that in the time of Romulus in the eighth century, the Romans had a year of 360 days only. The Bible also confirms that prior to the eighth century BC, each month had thirty days and there were twelve months to the year. As proof of this Hebrew scholars quote from the story of the great flood of Noah as found in the Book of Genesis. The great flood is quoted as beginning on the 17th day of the 2nd month (Genesis 7:11) and ended exactly five months later on the 17th day of the 7th month (Genesis 8:3-4), a period which is given as 150 days. Five months amounting to 150 days are equivalent to a year of 360 days. So the question posed earlier needs to be changed. 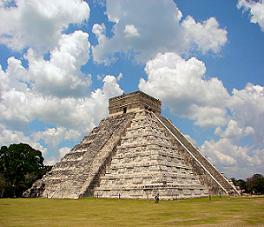 We do not need to ask why the ancient Maya had a year (Tun) amounting to 360 days. We need to ask what exactly it was that occurred to cause them to change the length of their year from 360 days to the present solar year of 365 and a quarter days. To answer this question, we need to investigate the riddle of the 52 year cycle that was known as the "Calendar Round". The basic unit of the Mayan Long Count calendar was the Tun. The Tun consisted of a cycle of 360 days. As we have seen, at the time that the Maya set up their Long Count calendar, this actually was the exact number of days it took for the earth to travel around the Sun. 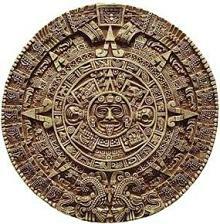 However, the Maya were not the only culture to use a calendar based on a solar year of 360 days. Ancient texts and sacred scripts show that the same length of year was also used at that time by the Egyptians, Persians, Hindus, Chaldeans, Assyrians, Hebrews, Chinese, Greeks and Romans. If these ancient texts are to be believed, and there was a time in earth's history when the length of the solar year was exactly 360 days, then the obvious question that arises is when did it change to its present length of 365 days, 5 hours and 49 minutes, and what was the cause of this change. The answer, according to these same ancient texts, is that some three and a half thousand years ago the earth had a close encounter with an enormous comet. The effects of this cometary encounter devastated the entire planet, generating mountainous tides that swept away entire cities, exploding volcanoes that incinerated forests, earthquakes that fractured the land, hurricane-force winds and tornados that annihilated man and beast alike, and a darkness that enveloped the world for five days. The devastation caused by this event was recorded by those few Maya who survived, as we can see from the following excerpts from their sacred books. Similar accounts of destruction raining from the skies were preserved in the Manuscript Troano of the Maya, as well as the ancient Mexican text of the Annals of Cuautitlan. They describe in vivid detail how the land was swamped by mega-tsunamis, and a terrible wind swept the earth. They called the agent of this destruction "Hurakan", from which our modern word "hurricane" is derived. The Aztecs called the age that ended in a rain of fire from the sky Quiauh-tonatiuh, meaning "the sun of the fire-rain." But the Mayan tales of devastation that had swamped their lands and created havoc among their people did not end there. They went on to describe how this terrifying demon of death had returned again after an absence of 52 years, to once again lay waste to their lands and wipe out their cities. Just 52 years after their last "age" had ended in a world-wide cataclysm, another world age now lay in ruins as a result of the second close encounter with this gigantic comet. And so was born the unique Mayan "52 year calendar cycle" that was to last right up until the Spanish conquest in the 16th century. The "Long Count" method of measuring time ceased to be an important feature of Maya daily life from that point onward. 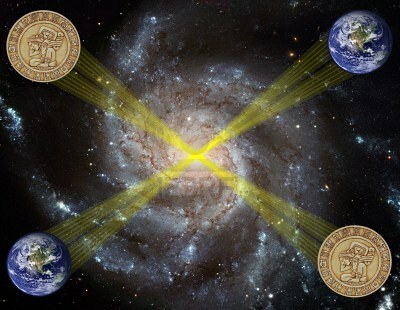 Instead, Mayan astronomers created a new cycle which would repeat itself after exactly 52 years. This 52 year cycle has come to be known as the "Calendar Round". Those astronomers and priests of the Maya who had survived the destruction of the previous 52 year cycle, waited in fearful expectation for the fiery comet to return and once again destroy their world. But fortunately for the Maya and for the rest of the world, the comet that had passed disastrously close to the earth on two previous occasions, 52 years apart, no longer returned to threaten the earth. However, the traumatic memories of those terrible days in their recent past made an indelible impression on those Maya priests who had survived their earlier encounters. As the 52nd anniversary of their last encounter with the comet drew near, so the entire nation became gripped with the fear of imminent death. Religious ceremonies were held, imploring their Gods to rescue them in their hour of peril. One can imagine the wave of jubilation that engulfed the entire Maya nation when it became apparent that there would be no third appearance of the comet, and that they had been spared to enjoy a new period of peace in the heavens. Yet, as the next 52 year cycle drew to an end, a new sense of impending doom arose. For there was no guarantee that the fiery Gods of the skies might not return once again to destroy them all. We do not know at what point some city ruler or priest came up with the idea of offering human sacrifices to ward off the return of the comet. But whenever that time was, once it had been found to be successful, it was incorporated as a vital and necessary ingredient of every 52 year cycle from that point onward. And what the Maya began, the Aztecs perfected, so that when the Spanish conquistador Hernan Cortez arrived on the shores of Mexico in 1519, he found thousands of unfortunate souls sacrificed in a single ceremony by having their beating hearts torn out of their living bodies. The outcome of these disasters was that the length of the year had changed. The earth had moved into a new orbit around the Sun taking five more days to complete its annual journey. And so, like all the other cultures mentioned earlier, the Maya amended their calendar by adding five extra days. 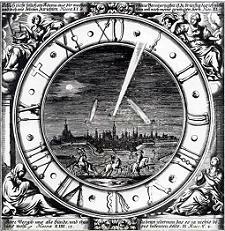 Their new solar year was called the "Haab", and the five extra days were referred to as Wayeb or "nameless days". When the comet returned after a lapse of fifty-two years to once again destroy the Mayan cities, the Long Count calendar of the Maya ceased to have any relevance in day-to-day society. That is because, as a result of these two close encounters with the giant comet, the earth had changed its axis and had moved into a new orbit around the Sun. The old solar year of 360 days (Tun) on which the Long Count calendar had been based, was now replaced by a new solar year called the Haab. As explained previously, the Maya adopted a unique 52 year cycle of time that has become known as the "Calendar Round". When this new system was first adopted, the Maya fully expected that their cities would be wiped out by the return of this comet every 52 years. Even when they found out that the comet was no longer a threat, they still continued to adhere to their 52 year cycle, and it remained in use right up to the arrival of the Spanish conquerors in 1519 AD.